On the set of a European director’s first American feature film, screen beauty Mabel (Jess Weixler, The Good Wife, Teeth) navigates the pretensions of independent filmmaking and her own inability to relate to the cast and crew around her. 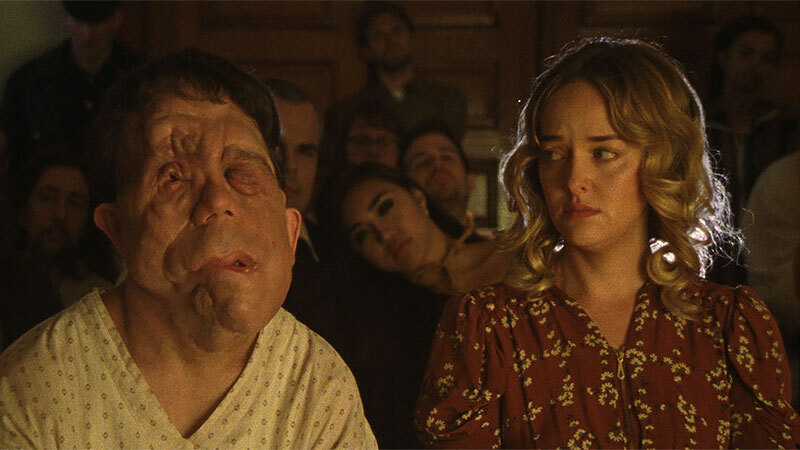 At Herr Director’s (played by ‘90s child star Charlie Korsmo) insistence, the film-within-the-film’s cast is predominantly actors with disfigurements and disabilities, including Mabel’s co-star Rosenthal (Adam Pearson, Under the Skin). Moving ambiguously between scenes from the campy horror film being made (think Todd Browning’s Freaks with an evil doctor) and the droll chaos of the film set, Chained for Life is a funny and complex satire of the significance we place on physical beauty on and off the screen. Cinephiles will enjoy the eccentric blend of art house and B-movie nods, while sifting through the meta-layers of this film about filmmaking and representation.